Sami Webb reacts as the ball bounces away from a team mate in the closing minutes of the game Tuesday. Dawgs have lead in the second and third quarters but let it slip away. HERMISTON - The Hermiston Lady Bulldogs lost to the Walla Walla Blue Devils 54-47 on Tuesday, December 2, 2008. 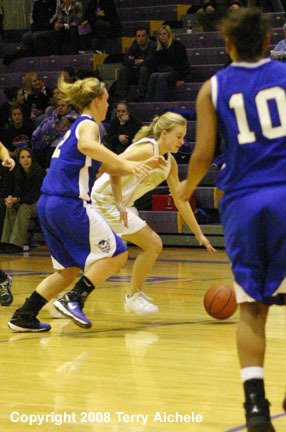 The non-conference game was the first home game for the Lady Bulldogs in the basketball season. Hermiston took an early 4-0 lead in the opening moments of the game. By 5:34 WaHi had taken the 5-4 lead. Hermiston was able to take the lead at 4:53 by a score of 9-7. From that point WaHi kept the lead and ended the quarter leading Hermiston 15-13. WhHi took the lead to 19-14 in the opening minute of the second quarter. Then Brook Davis hit a two pointer and Marie Pedro hit a free throw closing the gap to 19-17. Hannah Whitsett then tied it up moments later with a layup that made the score 21-21. Then at 2:55 Whitsett hit a three pointer to give Hermiston the 24-21 lead. The Bulldogs kept on the roll pushing their lead to ten points 31-21. WaHi comes back to score six points in the closing thirty seconds of the half. The half ended with Hermiston leading 31-27. Hermiston maintained the lead through most of the third quarter. WaHi tied it up 36-36 with 1:04 to go in the third. Hermiston missed some freethrows and WaHi pressed in the closing minute to take the lead. WaHi closed out the quarter with a 44-39 lead. WaHi controlled the game in the fourth quarter. Hermiston closed to 46-49 at the four minute mark. Hermiston scored only one freethrow in the remainder of the game. WaHi controled the ball by scoring five points and running off the clock for a 54-47 win. LEFT - The ball gets away from Mikaela Rivard of WaHi and Mary Shae Hayes of Hermiston during the first half of the game on Tuesday. 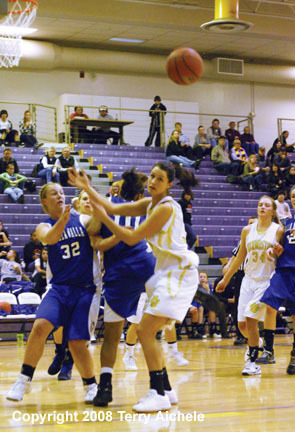 RIGHT - A Hermiston player threads her way through WaHi defenders. 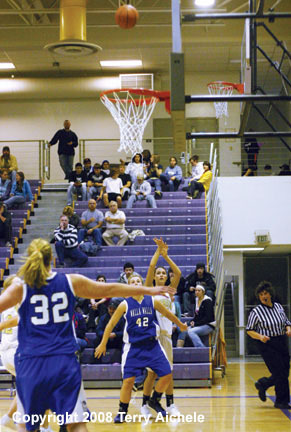 LEFT - Mary Shae Hayes takes a shot from the corner. RIGHT - Hermiston cheerleaders perform a lift during a time out during the game. LEFT - Hermiston cheerleaders perform a lift during a time out during the game. RIGHT - Jade Crossley battles a WaHi player to control a loose ball that was flying out of bounds. 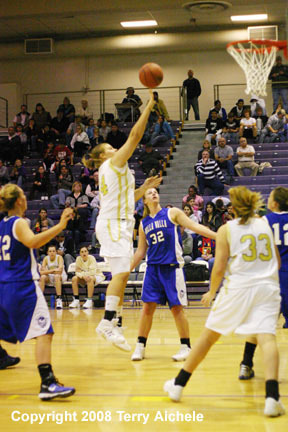 LEFT - Mary Teresa Barnett takes a shot. RIGHT - Hannah Whitsett takes a shot while being closely guarded by two WaHi defenders. 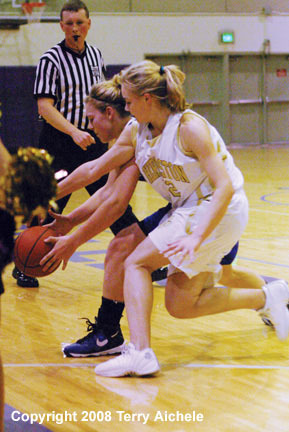 LEFT - Kathryn Barritz drives to the basket being defended by Mikaela Rivard of WaHi. 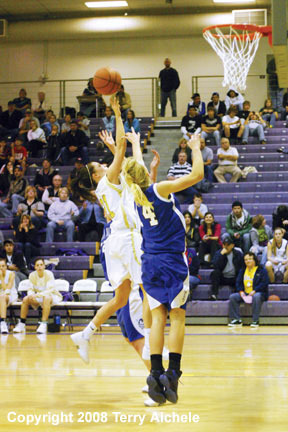 RIGHT - Hermiston post Mary Shae Hayes sets up for a pass.